Promising Ian a club trip it was decided that the round trip in OFD 1 would be a good introduction. Meeting at the burger van for the customary breakfast bap we headed of to SWCC to kit up and head down the hill. Jess took the lead for this trip and we were soon climbing down at the step and hopping across the pots to Lowe's climb. After pausing for the pretty formations we moved swiftly through the upper series to Pi chamber, on to the bolt traverses and through the escape route, dropping back in to the stream we made our way out via Pluto's bath and finished the day with a plod back up the hill. On our way we met a group of Duke of Edinburgh students who wanted to know if we'd been climbing! 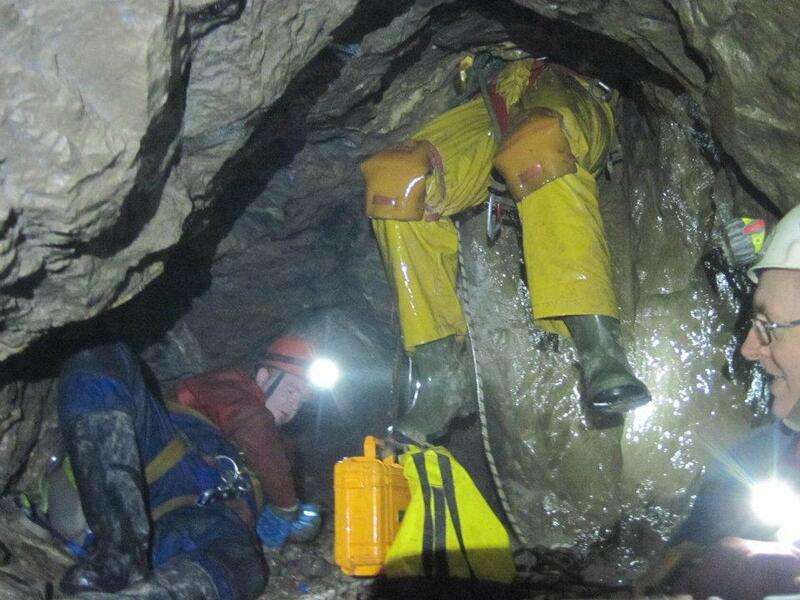 Would have thought the head lamps, yellow PVC suits and wellies would have been a clue, but I guess the youth of today must use very different climbing gear to in my day. 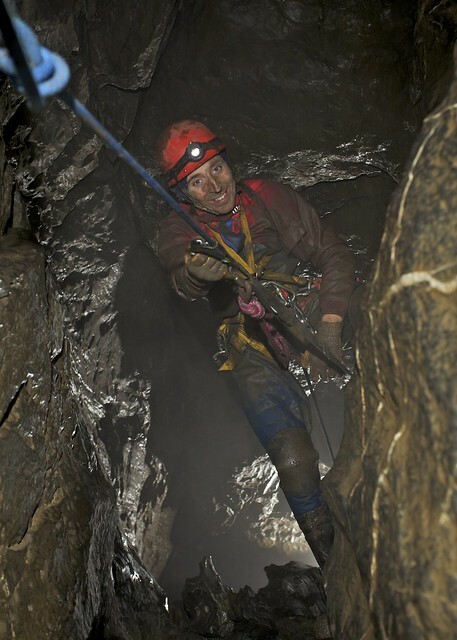 Grimes Caving Tours Are Back! 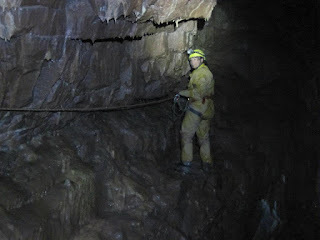 5 Cavers, 3 SRT Trips, 1 day. A quick cuppa at the Old Smithy Café in Monyash and the team set off for its first SRT trip of the day at Water Icicle Close Cavern. The road to the cavern turned out to be more like an off road rally course than a track and after a lot of mud and puddles (Carl even managed to go through a particularly deep puddle with his window open!) our 3 cars all looked an identical mud grey! Upon exit we found Wal informing another group of the situation and they also decided a different trip would be in order. We found out from them that a large group had been in the day before which may account for the bad air in the bottom of the chamber. Next up was Knotlow, after a little more mud splashed all over the cars we were soon heading for the climbing shaft entrance where again Andy rigged the first couple of pitches and Jess, Carl, myself & Wal Followed. At the base of the second pitch Carl posed for the fallen caver picture with the bolted boulder on the floor and then we were off for Waterfall chamber. I took over the rigging and Andy instructed to me to do the Y-hang off the closer 2 p-bolts. Knowing no better I did what I was told and sailed down the line straight into the spray from the impressive waterfall. After a quick poke around the coffin passages we headed back up and out with Wal ensuring Andy getting a good soaking on the prussik back up. Finally the most awkward of the 3 trips, and my personal favourite. 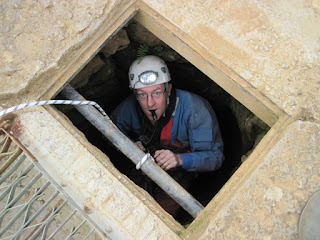 The Hillocks entrance is a concrete tube which soon opens out to walking and stooping passage which again degrades to crawling and finally flat out wet crawling passage to the head of the first pitch in a coffin passage. After rigging this I dropped down the shaft to a smaller hole before (after a little jiggling around with the SRT kit) popping out in a low passage. After this there was an awkward climb before heading down the 2nd pitch and through for a quick look at the Climbing and Engine shafts in Whalf before heading back out. Aside from Jess once again clambering all over me and giving me another set of bruises at the awkward climb out and another soaking in the flat out section, we exited without further issue and were soon back at the pub for a well-deserved drink before our drive home to wash the cars! Carl, Andy & Jess at the bottom of the 1st pitch. 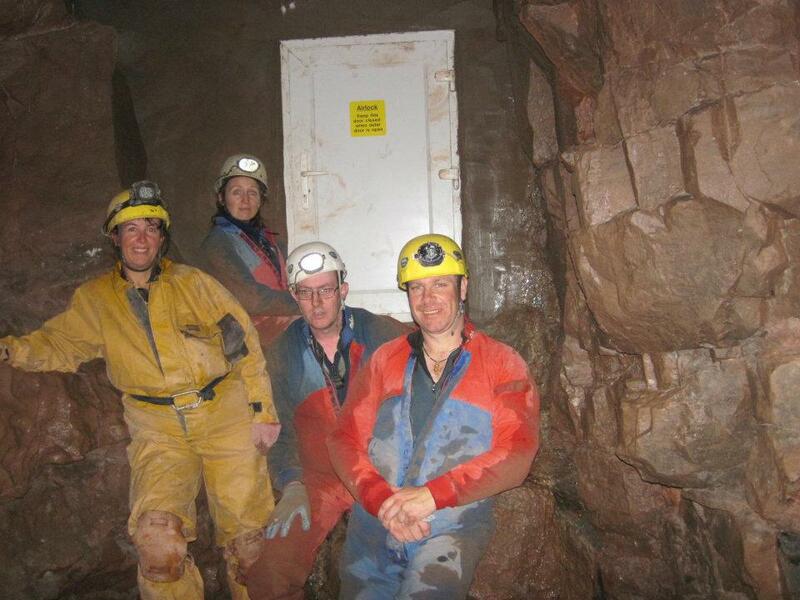 This wasn't a Dudley Caving Club Trip. 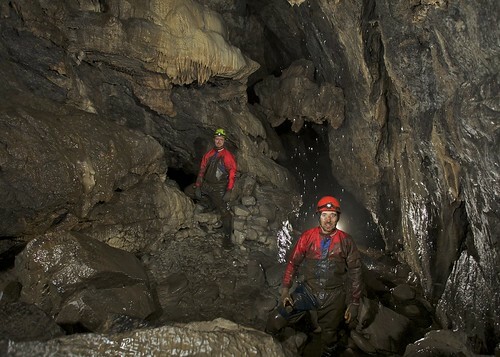 We cave quite often with Richard and Rachel from WMCEG and they blog their trips on Sterling Adventures where incidentally you can read Rachel's account of the trip which is illustrated with some of Brendan's excellent photos. The Sterling Adventures bloggers meet up annually to have adventures. This year Brendan and I were asked to lead this adventure. The video tells the story of the trip. Present: Brendan and Keith + Ian, Rachel, Richard, Pete, Tish and Dave. After having done the 3 highest peaks on mainland Spain last weekend Jess and I felt somewhat prepared for the arduous hill climb to the entrance to Tunnel cave in South Wales. Re-grouping we collected the key for tunnel and headed off to Dan-Yr-Ogof car park. After an half hour plod up the hill we paused to regain our breath. I rigged the entrance series, down the shaft to the second pitch, and was soon at an impressive calcite slope. Here a hand line is in place part way down, this continues around a quite exposed traverse, and drops down another steep calcite slope to balcony ledge and on to Cascade Aven Chamber. Andy, Mel and Jess soon followed and here all SRT kit was dumped in preparation for the rift passages. Straight ahead the route took us down a couple of climbs, one with a hand line in situ, although all were easily free climbable, though quite high, and on to some classic rift passage. After an awkward climb up we continued to traverse and crawl in the tubes and rifts following the description & looking out for Marble Arch Passage on the left to show we were on the right track. Eventually we came to a low sandy flat out crawl with a couple of squeezes. Deciding that I’d obviously missed something we back tracked and found that we should have dropped a little lower in the rift and we had actually taken Marble Arch Passage itself. Back on track we made our way to Saddle Corner and climbed up to a small left hand crawl into yet more traversing rift to Cross Junction. After more awkward climbs the passage began to open out and we eventually arrived at the air lock doors where we paused for a couple of pictures and a well-deserved break. On the way back we tried to follow the rift at a lower route, which found us losing our way once again and after analysing the cave description Mel realised we had made our way to Xmas Grotto. We had dropped out of the rift at a very awkward climb down and wasted half an hour finding an exposed traverse to take us back on track. Mel bypassed this finding a very tight climb up that none of the rest of us could follow and Andy was in fine verbal form letting us all know his displeasure at having to traverse at high level again! Faced with yet another awkward climb down, around a corner and sliding down a tube with nothing to hold on to for the last six feet, Andy ordered me ahead so he could stand on my back to get down. Jess went next and rather than stepping off my shoulders wound up sitting on my head and pinning me to the boulders!!! Back to the entrance series we de-rigged as we made our way out and were soon back on the hilltop looking forward to a drink in the pub on the way back. A very impressive entrance series with a fun high route to what must be the only cave in the country to have a set of UPVC doors at its heart! As ever my thanks go to everyone involved, although I’m not sure we’ll persuade Andy to do a return for the through trip!!! 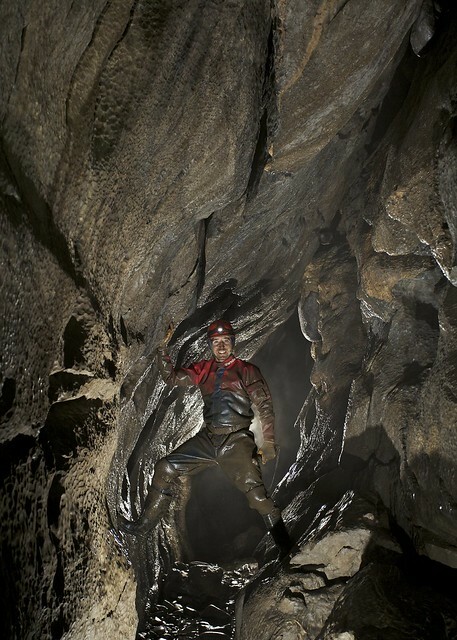 A day was spent in the Sychryd Gorge to explore Will's Hole and also one of the smaller Silica Mines. The 11m pitch was rigged with rope to give Ben and Carl some SRT practice underground. Once down the entrance pitch we headed to the downstream end of the cave which is very muddy with high mud banks from when the water backs up in flood conditions. 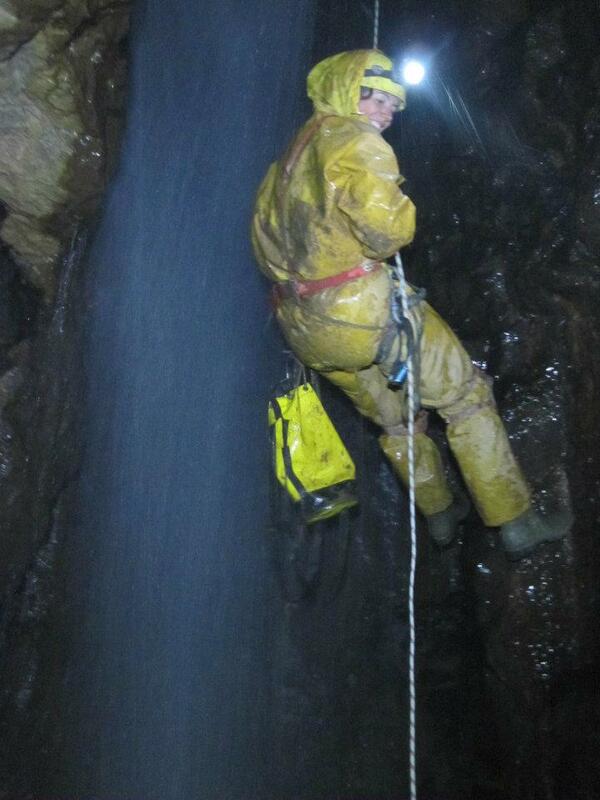 We then followed the passage to the higher level end having a poke around in the chokes at the end. 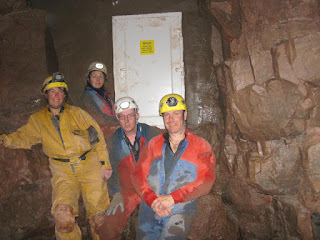 Once out the cave we headed down the river and explored the lower Silica mine.